The Global Compact Spanish Network, the Spanish Stock Exchanges and Markets (BME) and CNMV join to this international initiative that is celebrated in more than 80 Stock Exchanges around the world. 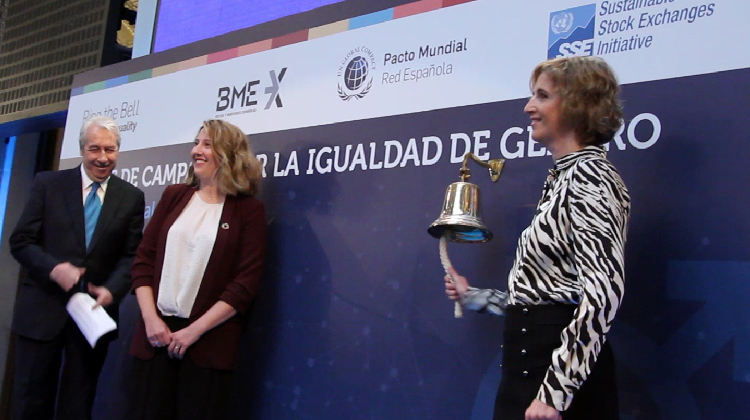 The Spanish Stock Exchanges and Markets (BME) started its activity with the Ring the Bell for Gender Equality, which is celebrated on the occasion of the International Women’s Day in more than 80 Stock Exchanges around the world. The initiative, organized by BME and the Global Compact Spanish Network, is part of the international movement “Ring the bell for Gender Equality”, which is supported by Sustainable Stock Exchanges. The vice-president of the CNMV, Ana María Martínez-Pina, has been in charge of carrying out the Ringing of the Bell. Along with her have been the president of BME, Antonio Zoido, and the acting executive director of the Global Compact Spanish Network, Cristina Sánchez. The event was attended by more than 150 people. The common thread of the speeches has been the importance of working for real equality between men and women for the economy and for society as a whole. The vice-president of the CNMV stated in her speech that "neither companies, markets nor our economy can afford to give up the talent of half the population; the balanced presence of men and women is an objective that we must all pursue". On the other hand, Cristina Sanchez has stressed that this initiative helps to raise awareness in society and encourages their involvement with gender equality. "The figures show that if women participated fully in the labour market, world GDP would increase by 28 trillion dollars. Antonio Zoido, president of BME, highlighted that "incorporating equality policies must be on the agendas of governments and boards of directors, because it improves productivity, competitiveness and prosperity of society. Gender equality is a very present issue in Agenda 2030, with a specific Sustainable Development Goal, SDG 5, which addresses the issue at all levels, including the business sphere. Moreover, current trajectories show that existing interventions are not enough to achieve a 50-50 planet by 2030. The Sustainable Development Goals therefore call for transformative changes, integrated approaches and new solutions. In response to this reality, Ring the bell is a global movement that aims to raise the society and in the business sector awareness and encourage their commit to equal opportunities, to sign the Principles for the Empowerment of Women, to promote diversity in senior management and to improve transparency in gender policies and practices, among other issues.